Dice in board gaming are quite a polarizing topic. Some people, the “true believer” board gamers, hate the addition of luck; griping that it takes skill out of the equation. Others, like myself, love the dice as an equalizing mechanism: the dice giveth and the dice taketh away. Sure bad dice rolls can harsh your groove, but it’s still just fun to grab a handful of dice and chuck ’em. No matter which way you roll, you have to admit that dice are here to stay. 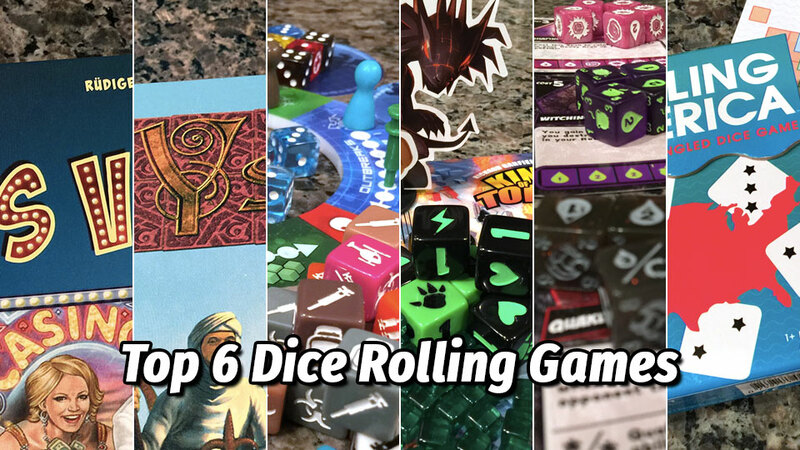 I love dice, and I’m really excited to share with you my top 6 dice rolling games. Las Vegas is an excellent game, for experienced gamers and novice gamers alike. It’s simple to teach, easy to play, and takes less than an hour to play. In Las Vegas players will be rolling dice at 6 “Vegas” casinos (each represented by one die face, 1 – 6). Roll your dice, group them by number, then pick one group to place at a casino matching that die face. That’s your entire turn! Continue around the table, rolling your remaining dice, and picking one group of dice to add to a casino until all players have placed all of their dice. The player with the highest number of dice at each casino gets the largest reward at that casino, in the form of bills in $10,000 increments. There may or may not be a second place so fight for your right…to ROOOOOLLLL DICE! Las Vegas is one of my favorite games of all time. It has enough meat, and clever decisions that experience gamers won’t feel like it’s all luck, while being easy enough for new gamers to pick up. With only a single choice per turn, it really comes down to weighing the odds, and trying to outsmart your opponents. Las Vegas plays from 2-5 players (up to 8 with the optional expansion), and is just a blast. Every lover of dice games should have this one in their collection! Read my complete review of Las Vegas. Yspahan is a deeper, more strategic game featuring my favorite mechanism: dice placement. In Yspahan each player, at the beginning of their turn, will roll all of the dice, grouping them by face. They’ll then place all of the dice into slots on the Tower board. In turn order each player will select one of the options on the board and take the corresponding action the same number of times as there are dice in that group. 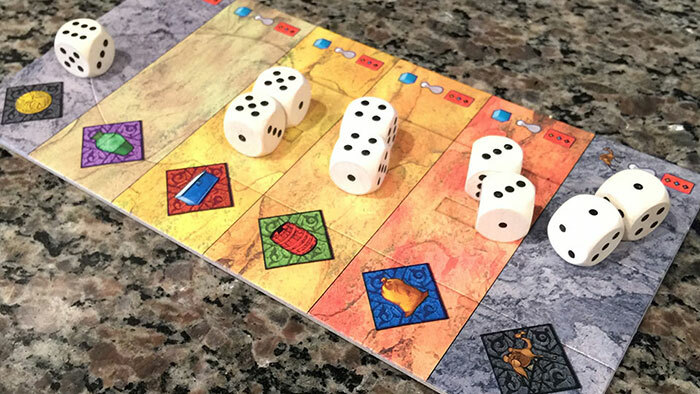 Those actions might be to take camels or gold (both used as currency in the game), or to place merchants (cubes) onto the game board to control certain areas. A game of Yspahan plays over the course of 3 weeks, each broken down into 7 days. At the end of each week players will score for areas they control on the main board, goods sent off to the caravans, and for buildings they’ve constructed. There’s a good amount of strategy to Yspahan, while still retaining the element of luck, and that dice rolling goodness. I’m a big fan of the dice placement mechanism. Given a large enough pool of dice you’re going to get something you’ll be interested in. While it might not play to your desired objective, Yspahan has enough of a variety of choices that you’ll be able to accomplish something useful in your turn. I try to teach Yspahan to everyone. Maybe you’d like it too! Read my complete review of Yspahan. Pandemic: The Cure is a dice based version of the best-selling game Pandemic by Matt Leacock. Pandemic: The Cure is a co-op game in which players attempt to treat, and cure, diseases by playing as researchers, scientists, dispatchers, containment specialists, and other unique characters. Each character has a unique special ability along with a set of custom dice in their color. Each player’s dice are distinct to them, and all of their dice offer the same 6 faces. Players roll their dice, and can continue rolling until they choose to lock a die in. Dice offer movement ability, disease treatment, researching a cure for one of 4 diseases, or any number of player specific abilities. But act wisely because at the end if a player’s turn you’ll be infecting the world by pulling gorgeous crystal clear disease dice from the “infection bag” and rolling them. Match the disease die face to one of the 6 areas of the world. Make sure you balance your actions or you’ll quickly be overrun and forced into a deadly outbreak; ratcheting up the outbreak counter until you perish. There’s only one way to win, by curing all 4 diseases, but there’s many many ways to lose. Some might ask if Pandemic: The Cure is worth getting if you already own Pandemic. The answer is yes yes yes! While the basic premise of the game is the same, cure 4 diseases, the way in which the game plays is totally different. It’s less thematic, but takes up far less space. It has totally different mechanisms, but has a number of ways to mitigate poor rolls. It has a touch of push your luck to it, but allows players to lock in selections to avoid an overly high number of penalties. Pandemic: The Cure is a challenging game, with good decisions to be made. It’s an excellent way to ease new players into the Pandemic universe, and if your friends or family are already familiar with Pandemic, then it’s easy to get set up and rolling…dice that is! When Quarriors released in 2011 it caused something of a sensation. 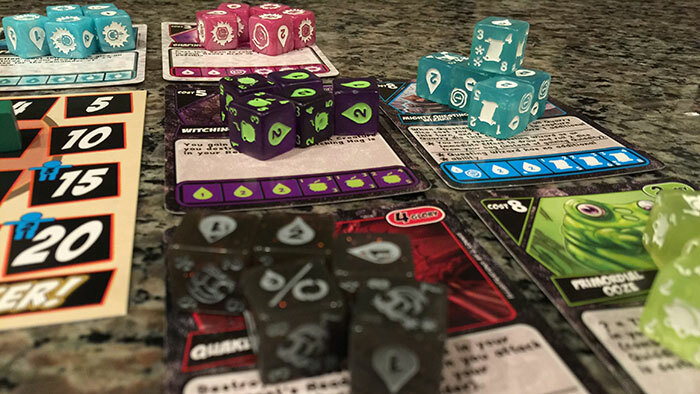 The notion of a deck building game had been around since Dominion released in 2008, but Quarriors turned that notion on it’s ear by using dice instead of cards. In Quarriors players act as mighty wizards controlling legions of creatures, each represented by a single die. Shake your bag, summon your minions and roll them onto the battle field. Rolling the mysterious Quiddity allows players to summon their minions to the battlefield in hopes of scoring Glory; or do you spend it all to capture more powerful minions from the Wilds? The base game comes with 130 custom dice and a number of cards featuring spells, minions, and other abilities. Set up is fast, and offers a good amount of variety just in the base game. Mix things up by adding one of the dizzying array of expansions. Quarriors plays fast which means it can keep my kids attention. Quarriors isn’t just for kids though, it also offers a good amount of tactical choices. Because of the varying setup no two games will be quite the same. Quarriors is an excellent addition to any dice lover’s collection. The other games on this list are excellent, but none of them are a certified mega-hit like King of Tokyo. Who would have thought that Yahtzee with monsters was a good idea, but it’s not just a good idea, it’s a great idea! 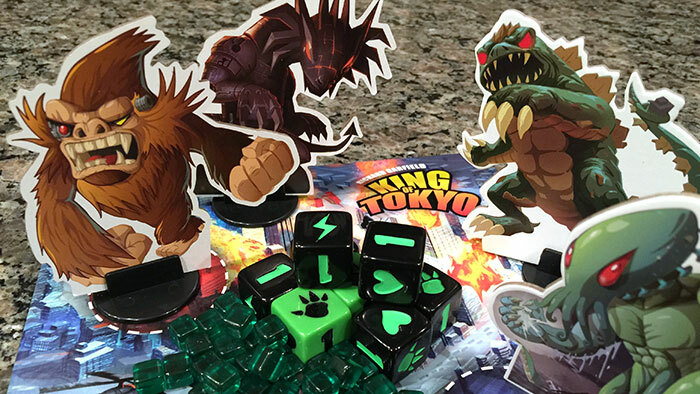 King of Tokyo features gigantic, heavy dice, a stack of gorgeously illustrated special ability cards, and a pile of clear “energy” cubes which can be spent to acquire those special abilities. In King of Tokyo each player controls a monster bent on the utter destruction of Tokyo (cliche I know, but oh so sweet!). Every other monster wants the exact same thing but there’s only so many subway cards full of yummy people to go around after all. King of Tokyo is pure dice slinging fun, mixed with a bit of push your luck. King of Tokyo is the perfect game to introduce new people to board gaming. It’s super light, hella fun, and allows players to be as aggressive or as passive as they like. Play with a tight group of friends and dominate the table with direct attacks, or play casually and go for points. Either way your group is going to have a great time with King of Tokyo! I never would have guessed that I’d like this small box game, but it’s great. Small, portable, and challenging. 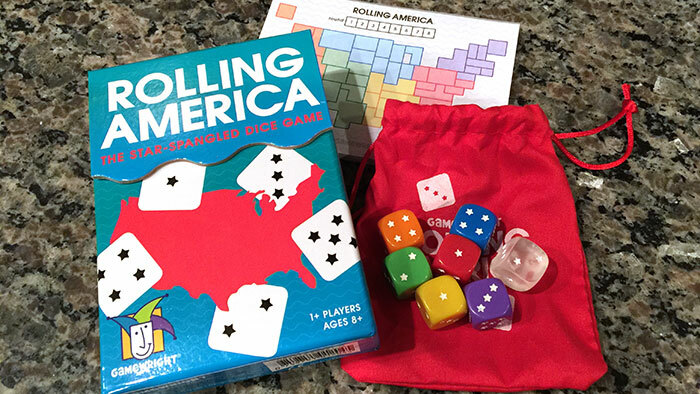 Rolling America is a great game to carry to parties, bring to the pool, or even play on the patio. Rolling America is published by Gamewright who have a great track record for light family games! Rolling America features 7 beautifully colored dice (with stars as pips! ); 6 different colors, and a frosted “wild” die. On their turn players pull 2 dice from the bag. All players must then mark that die number and color somewhere on their stylized map of the US. Colors must match colors and each newly placed number must be within 1 number of any number which it touches. If you want to put a blue 3 onto your map, then it can only touch a 2, 3, or 4. Players are given 3 special game changer abilities at the beginning of the game, each of which can be used 3 times. One lets you alter the color of any die (for you only), one allows you to “guard” a die, allowing you to place any number die next to it, and the final ability allows you to clone a die (using it twice in a turn). The game goes for 8 rounds, and at the end of the game any empty spaces count against you. On the surface Rolling America appears to be a simple game, but it has a good amount of complexity. 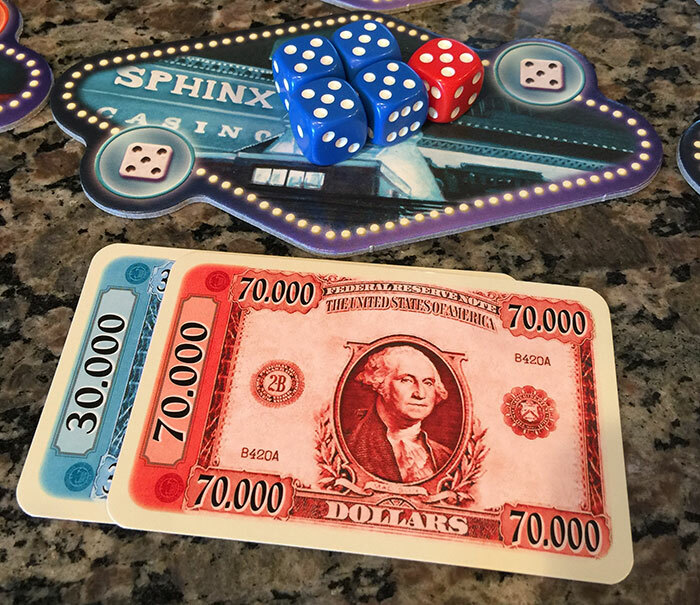 Because of the dice, no two games will be the same, and you’ll find yourself saying “PLEASE roll a red 6” more than once…sometimes even in the same game. It’s cheap (only $10 at Target or Amazon) and deserves to be in anyone’s collection! It wouldn’t be a top 6 list without a few games that didn’t quite make the cut. Here’s a few more games that could stand up to the wind on your back porch! Roll for the Galaxy is the dice version of Race for the Galaxy. It showcases loads and loads of custom dice in all sorts of colors with all sorts of icons. In Roll for the Galaxy players attempt to conquer the universe through diplomacy, conquest, and trade…all by rolling dice, selecting roles and attempting to outguess their opponents. Clever use of dice and abilities gained through purchases will help you rule the universe. In Machi Koro players act as mayor of the most charmingly illustrated metropolis since Richard Scarry’s Busy, Busy Town. 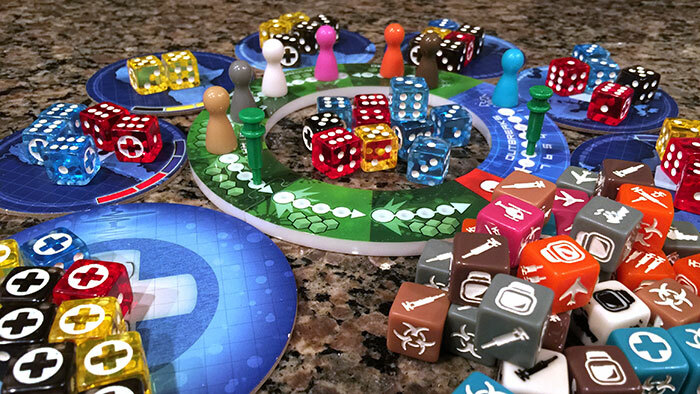 While Machi Koro is primarily a card game, the dice are the star of the show. In Machi Koro players will purchase cards representing various businesses and place them in their own personal tableau. Each card has one or more more numbers ranging from 1-12, along with a description of what happens if you roll that number. Players roll either 1 or 2 dice, then everyone takes the appropriate actions for their town. Will you diversify your town, or double down on a few key industries? Find out in Machi Koro! What dice game list would be complete without a game with a push your luck mechanism? Dice Bazaar has it in spades…or is it pips? In Dice Bazaar players purchase goods from the merchant by rolling their dice and matching die faces with corresponding dice found under each product. Be the first to purchase a product and you get to reset the market (and mess with your opponents) by rerolling the dice. Each purchased product can be upsold to gain even more points. Control the market and win the game in Dice Bazaar. If one push your luck game is good, then two should be even better right? In Zombie Dice players act as zombie trying to be the first to eat 13 brains. Filled with brains, shotgun blasts, or “runners”, players will need to decide to stay with what they’ve got or push their luck and go for more tasty tasty brains. Get too many shotguns and your turn is over, and you lose everything you’ve accumulated that turn. Zombie Dice is fast and frightfully fun for the whole family…a family of the undead!